Discussion in 'Custom Cases & Projects' started by KSliger, Feb 21, 2018. 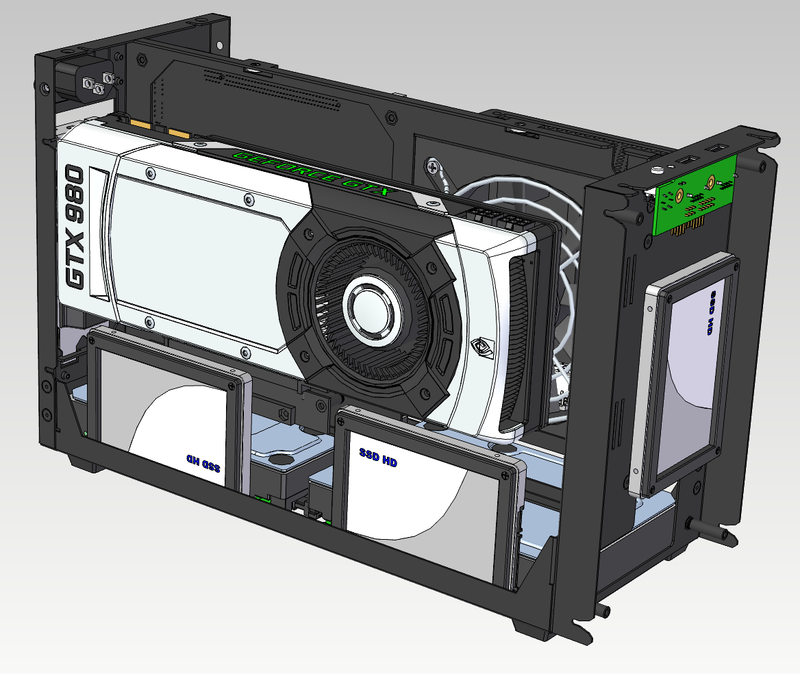 Triple slot GPUs up to 310mm, or bifurcated riser for dual slot GPU + 1 slot PCIe card (Network/Capture/Sound/etc.). Yes, another Dan A4/Loque/ThorZone style layout I know, but aiming to make this unique with fitting almost all components and build types, and also making it affordable-ish, customizable, and readily available. 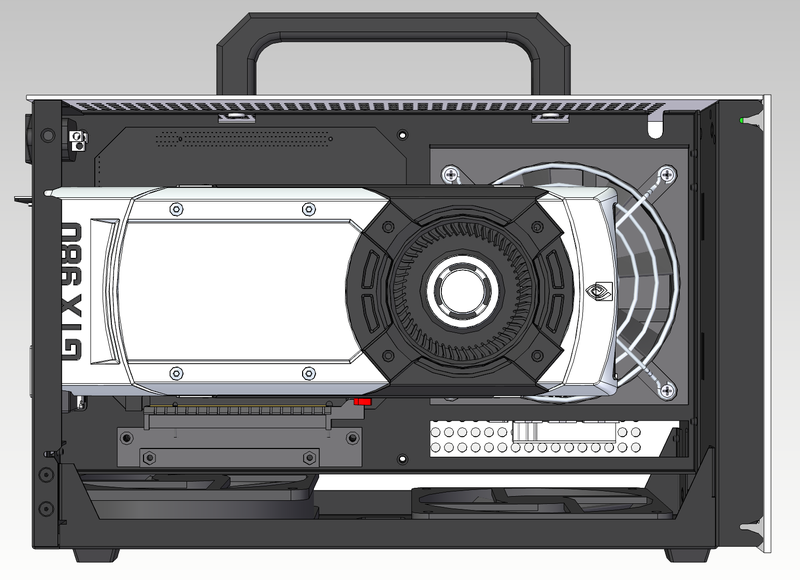 With 2 slot GPU can mount 2x SSD vertically, 2x 3.5" HDD in bottom, and 1x 2.5" SSD behind front panel. 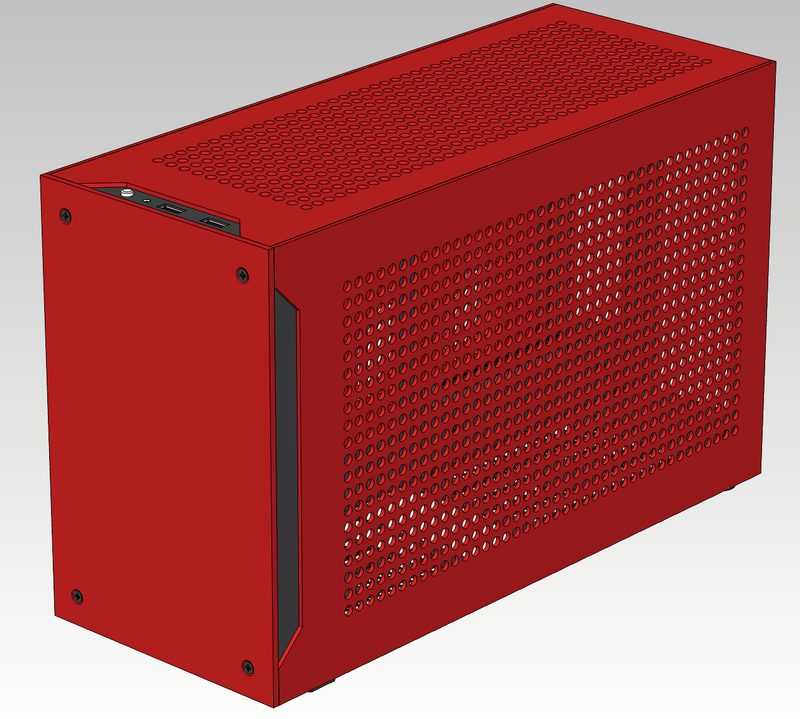 Alternate configuration with 1x 120mm fan, 2x 2.5" SSD, and 1x 3.5" HDD. 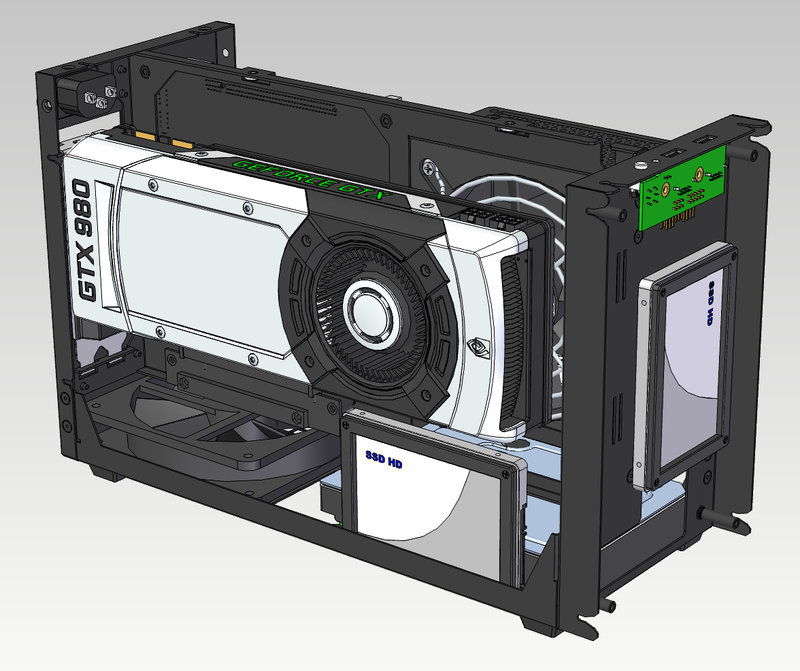 Mounting for SFX-L PSU is reversible, can pull air off the GPU side or from outside of case. Let me know if you have any recommended changes or tweaks, questions, feedback, etc! I do know it looks like Dan's most recent C4 layout, (Sorry Dan) so I'm still playing around with how to not make it look like his but still keep the characteristics of my SM case line. Talyrius, SashaLag, Weredawg and 24 others like this. This is awesome, the handle is very useful. In for red when this comes out. Looks great, although the front panel looks kind of plain as it's just a completely flat panel screwed onto the front. Any idea on availability? Looks good, what is your cpu cooler clearance? Handles are mandatory on cases now in my opinion. I agree, will see how the prototype comes out looking and see if I can come up with anything nicer looking at that point. Flat was just to be inexpensive, which it does really well, and also so it could be stood up on it's front face (feet mount on bottom or front) but it's... kinda silly looking upright (need a removable cable cover) and over laps market with @DSE 's case. Haha see above per standing it on the front face. I love desk space. Arboreal and gunpalcyril like this. @KSliger I was actually about to buy your handle for cerberus to use on DSE's case lol. Also, if you use non-sfx-l psu and only sfx, and also cut out the support frame section underneath, is there a possibility to use a 120mm aio in this case? Screw-less front cover would be aesthetically better to me. I'll check with DSE if he has handle support on current rev. That's a great idea for a change, I'll see what I can do. It's a possible change, would need to flip the BSO's on the chassis to be from the front panel and screw in on inside of the chassis - which would entail reversing the SKC cutouts for the side panels to slide in from rear via cutouts in the flange bends. Would also eliminate the ability to have a grained aluminum front as I cannot grain BSO's. I'll take a poll on screws or no screw once I have prototype in photos. DKsystem and gunpalcyril like this. It would be interesting if this would support vertical orientation, but not on the front face but on the rear, so all cables exit on the surface of the table and at the rear (bottom of the case in horizontal orientation). You could make an optional kit for this that mounts to the frame (in black) and allows feet to be attached. This way the clean sides would all be visible while the more "unclean" sides (bottom and rear on horizontal orientation) are hidden from plain sight. And you'd have your distinguishing feature. Supercluster and DSE like this. This. 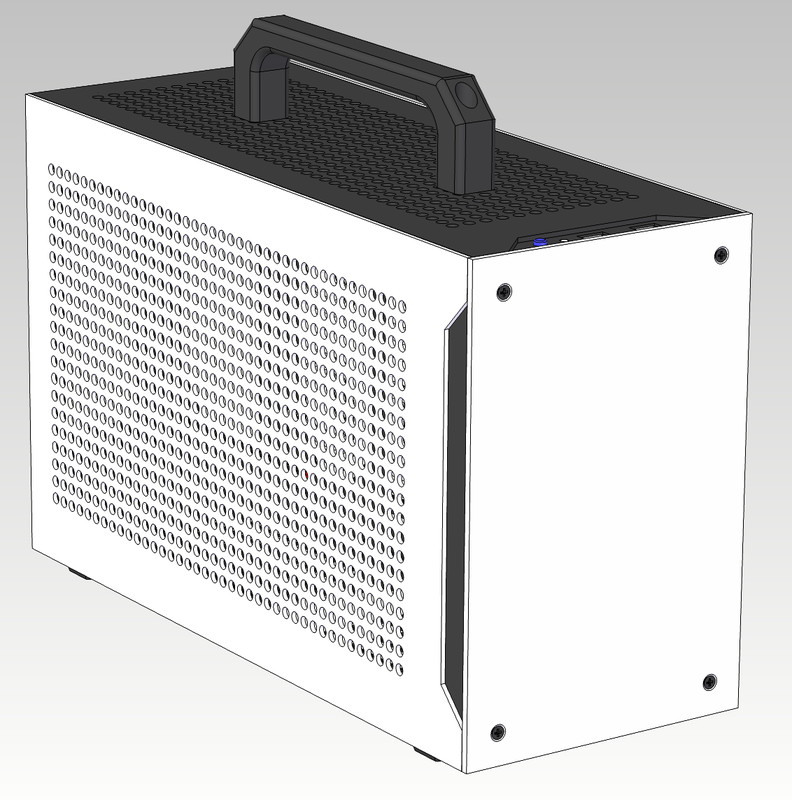 Seriously the first case maker to get a vertical oriented itx case done right is bound to make waves. Phuncz and DSE like this. talkion, renecop545, FullForceRainbow and 4 others like this. @KSliger Any chance that mounting two 2.5" SSDs behind the front panel? and what about CPU Cooler clearance? Looks cool. 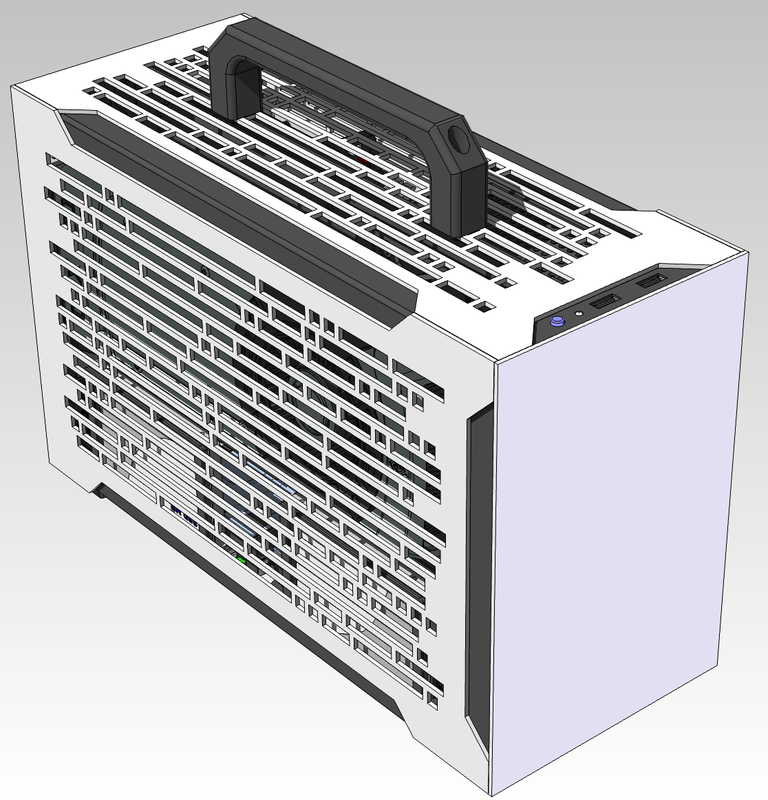 you can probably, make the outer shell CNC aluminum and bended with cutouts for your I/O and you'll have IMO a more aesthetically pleasing looking case. 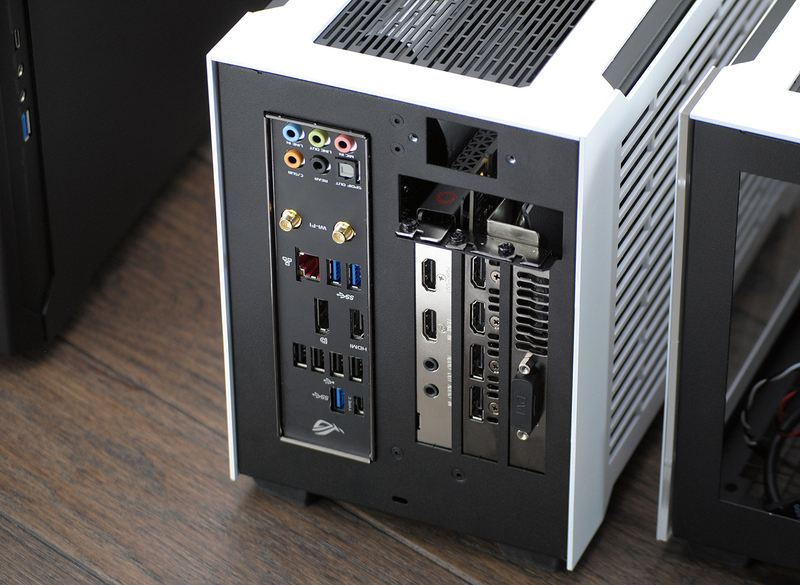 - Rotate the power supply so that it has its own air intake from the sides. 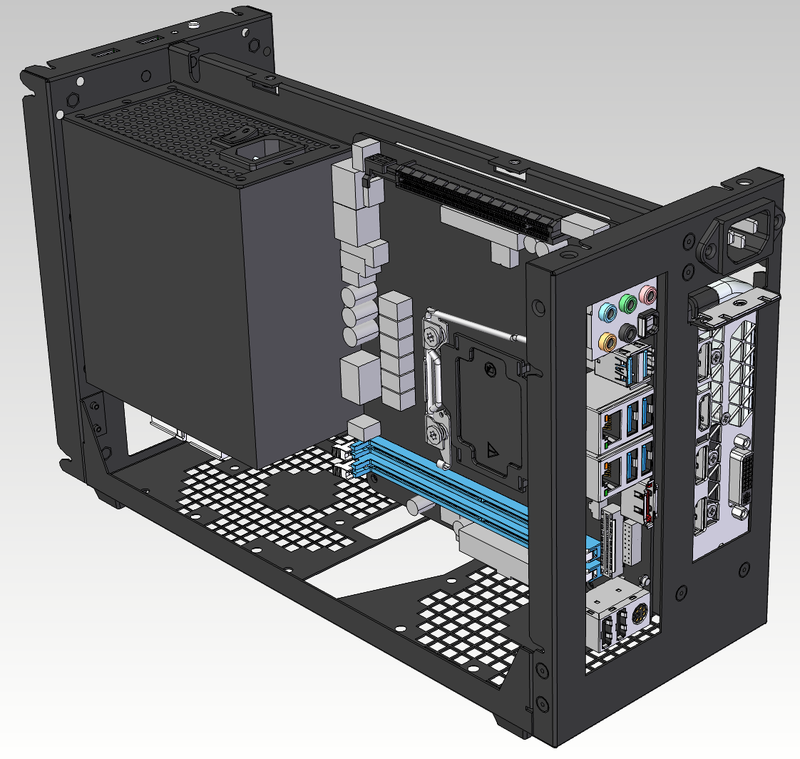 - If its me I will widen the case a bit and make it three slot and add a Pci Slot HDD bracket accessory. - understood why you placed the outlet on top, BUT if you placed it at the bottom (and run a longer cable) you could a. free the top for taller GPUs b. by raising the pcie slot a bit you could free the bottom for potential HDD space? Best wishes to your design. yah! Finally another case with a handle. Hopefully it'll get past the prototype stage. Maybe its because of the pics, but I think it resembles the Cerberus too much for me. Also, I agree with placing the power plug at the bottom since most gpu coolers blow heat out at the top. From my experience of carrying around my SG05,I find that weight becomes an important factor. And sharp corners aren't good if you're gonna be moving around frequently. Want one already Do you have any expected shipping day? this is nice, like a mini cerberus. i like the reversible psu and the ability to mount a 3.5 drive on the bottom. Awesome design! If i had any suggestion, it'd be a fan mount instead of the front 2.5" mount..
Arboreal, owliwar and Phuncz like this.